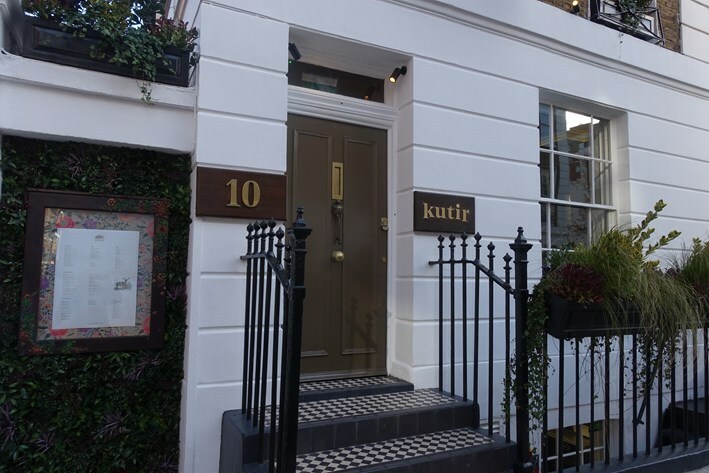 Kutir, meaning “cottage’ in Sanskrit, opened in November 2018 in the Chelsea town house that used to house Rasoi Vineet Bhatia. It is an independent venture from Rohit Ghai, who was executive chef of JSK restaurants, including Michelin starred Gymkhana and Trishna. 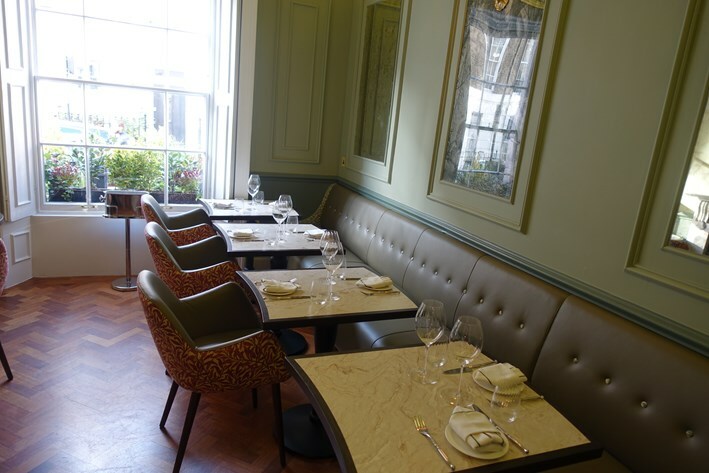 Mr Ghai then moved on to get a Michelin star for Jamavar, so he has a serious track record. 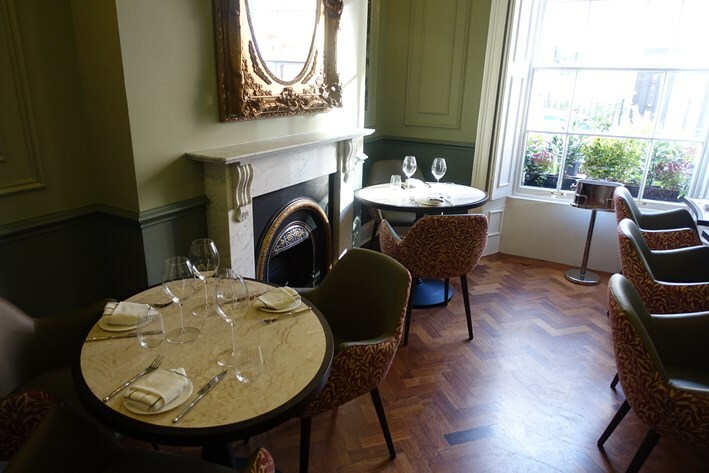 The wine list had 101 labels with a median price of £68, starting at £29 and rising to £489. 49% of the list was from France, with 23% from Italy. 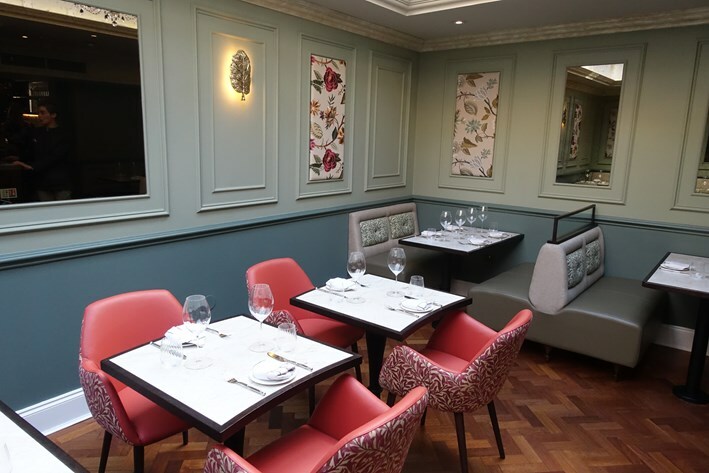 Sample references were Domaine St Hilaire Chardonnay2016 at £33 for a bottle that you can find in the high street for £9.60, Domaine Maillard Pere et Fils Chorey Les Beaune2016 at £72 compared to its retail price of £24, and Laurent Perrier Brut Rose NV at £125 for a wine that will set you back £67 in a shop. For those with the means there was Chateau Talbot 20001 at £210 compared to its retail price of £90, and Chateau Lynch Bages 2008 at £388 for a wine whose current market value is £134. The median markup was 3.4 times retail price, which is pretty steep, even by the demanding standards of London. For those looking for relative value, the least heavily marked up wine by some way was the Stag’s Leap Artemis Cabernet Sauvignon 2014 at £78 compared to its market value of £60. I’d be quick before the sommelier spots this relative bargain and takes his red pen to the price. In general the wine list had a decent range, though for me it was not very well tailored to Indian food. For spicy food you ideally want wines that have a lot of fruit and aroma e.g. Riesling or Gewürztraminer, and avoid heavily tannic wines e.g. young Barolo, or wines high in alcohol. Champagnes work well. For reds, you want fruity, lighter wines like Beaujolais or Grenache-based wines of the Cotes du Rhone, or a Californian Merlot or even Zinfandel. This list almost studiously avoided most of those ideal matches, with no Gewürztraminer and little in the way of lighter reds. Instead there are lots of big alcoholic reds from Bordeaux, Barolo and Argentina. These are nice wines in themselves, but are not an ideal pairing for Indian food. 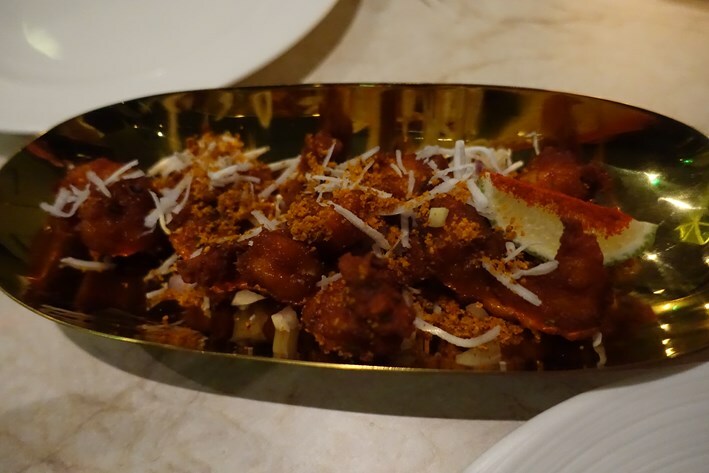 We started with fried masala prawns, which were fried and served with a quite spicy sauce. The prawns were nicely cooked and the chilli kick from the sauce was lively (14/20). Aloo tikki is a classic street food dish, here given a more elegant treatment than is normal. 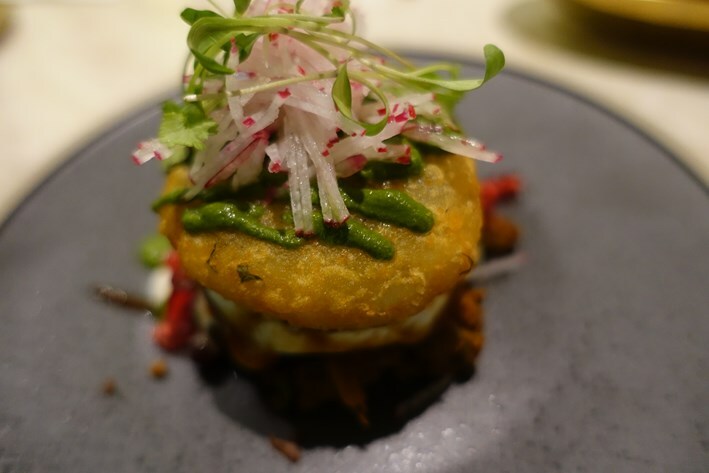 A crisp potato cake rested on a bed of peas with pomegranate seeds bringing freshness, the tikki given a pleasing hint of sweetness from tamarind chutney. This was a really well balanced dish (15/20). 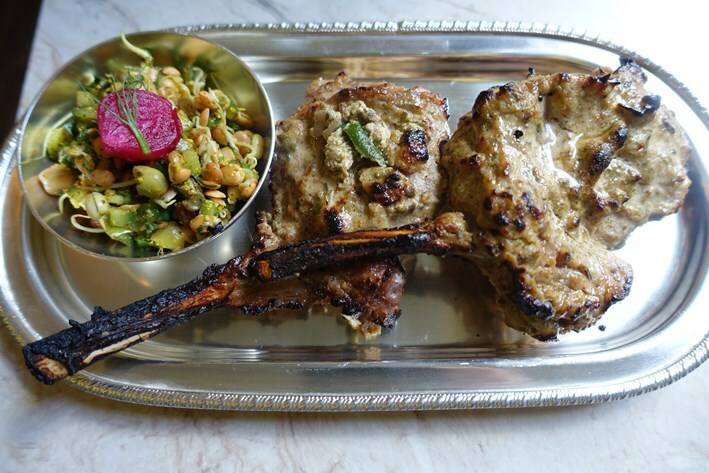 Even better was tandoori lamb chop, a classic dish where the lamb is marinated in spices before being cooked in the tandoor. Here the lamb arrived pink, having absorbed the spices including back cumin, and served with a little salad involving onions and sprouts. The lamb was succulent and had absorbed the spices well, the result a real delight as it melted on the tongue. I have eaten plenty of tandoori lamb chops over the years, but none better than this (17/20). 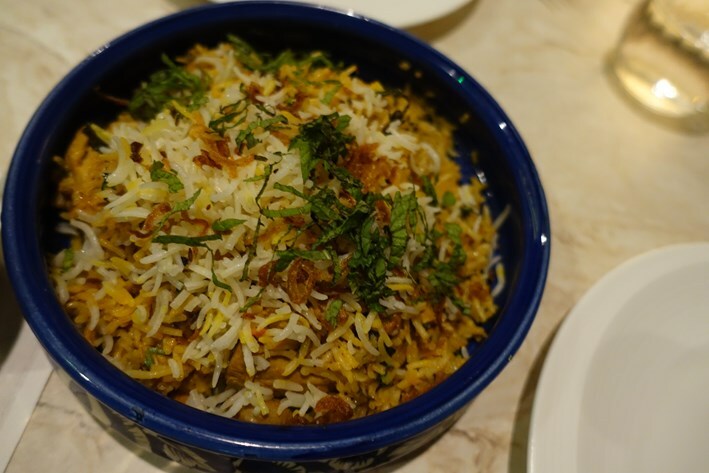 Guinea fowl biryani had aromatic rice with clear distinct grains, the meat avoiding dryness and the spicing subtle (15/20). 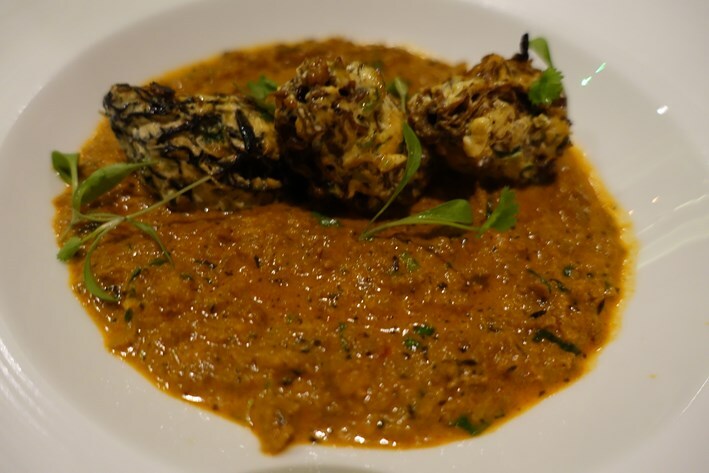 Kashmiri morels were lovely, served on a bed of soya based sauce, the mushrooms having lots of flavour packed into each bite from the spices – a lovely dish (15/20). 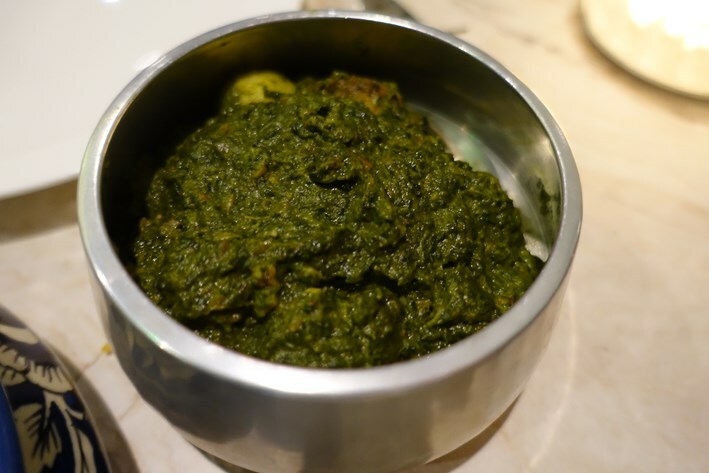 On the side, sag aloo kept the texture of the new potatoes well, with the spinach retaining its flavour nicely (14/20). 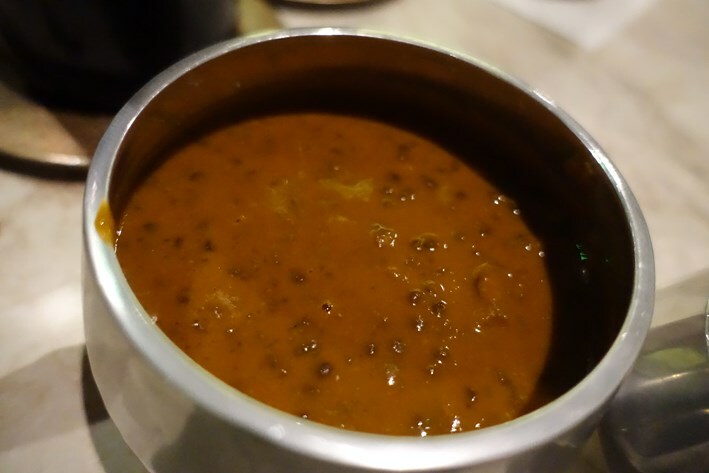 Black dhal, cooked overnight, had a rich, smoky flavour (15/20). Breads were excellent, supple and having good texture (15/20). 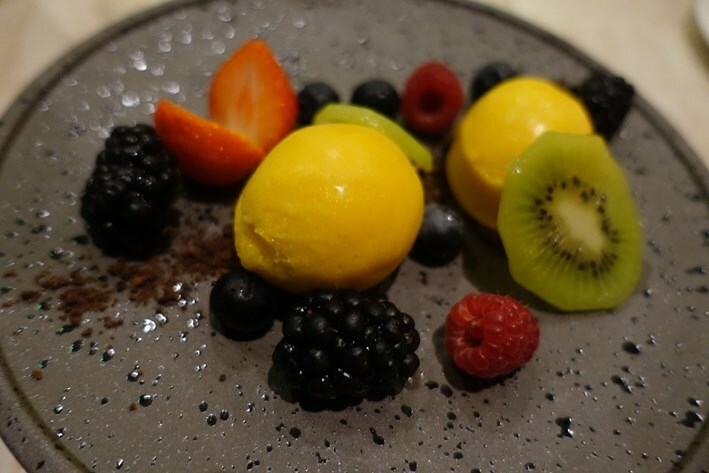 For dessert, mango and passion fruit sorbet had smooth texture and plenty of fruit flavour (14/20). 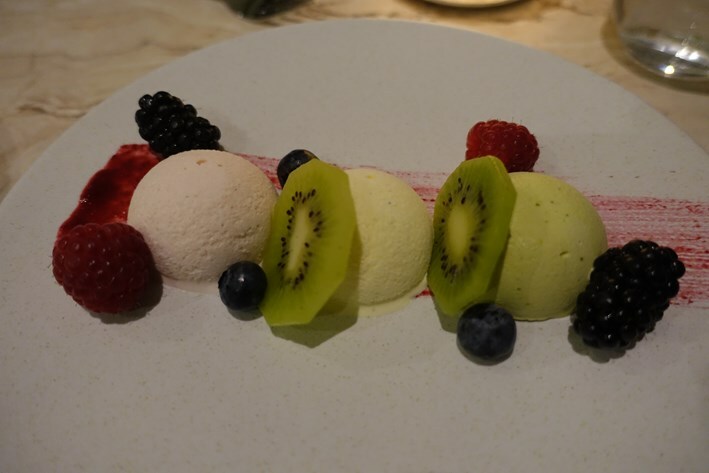 A trio of kulfis featured pistachio, almond and rabri, made with saffron and rose water. Again these had smooth texture (14/20). Coffee was apparently from H.R. Higginss. Service was led by co-owner Abhi Sangwan, who had worked with Rohit Ghai before at Gymkhana and Jamavar. Our waiter was charming, and it turned out that he served me years ago at Zaika, so clearly has a better memory than me. He was attentive and very polite. Overall this was an impressive meal, especially as this was literally the first evening of service – no teething troubles here. 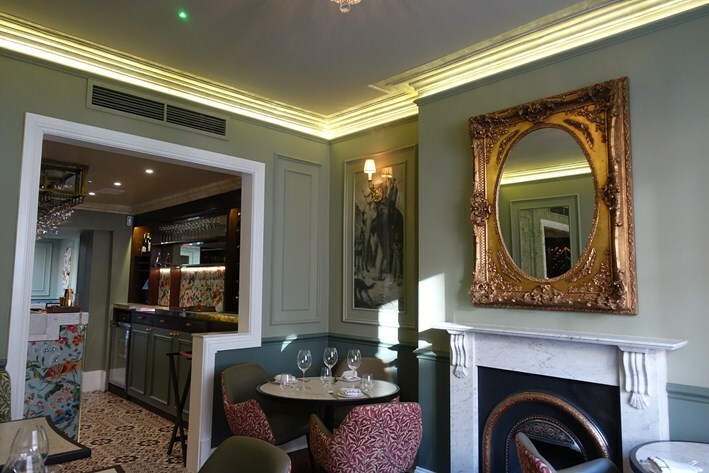 The food was classy, and the best dishes were top notch. Service was also excellent. At a second visit I tried some different dishes. 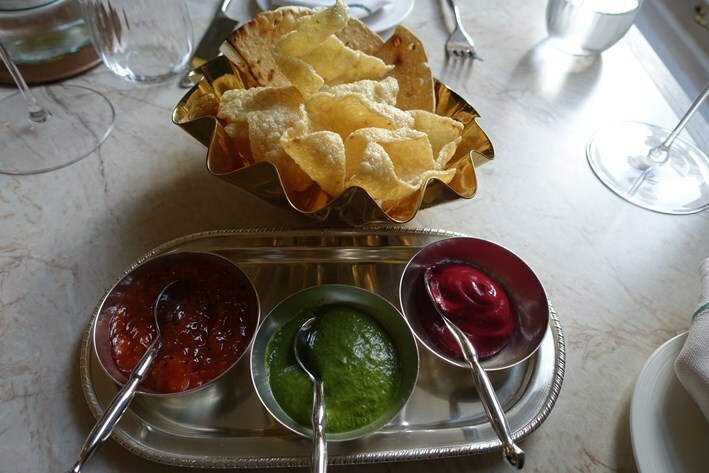 Popadoms came with a trio of chutneys, of which the star was a spiced mango with pineapple chutney. 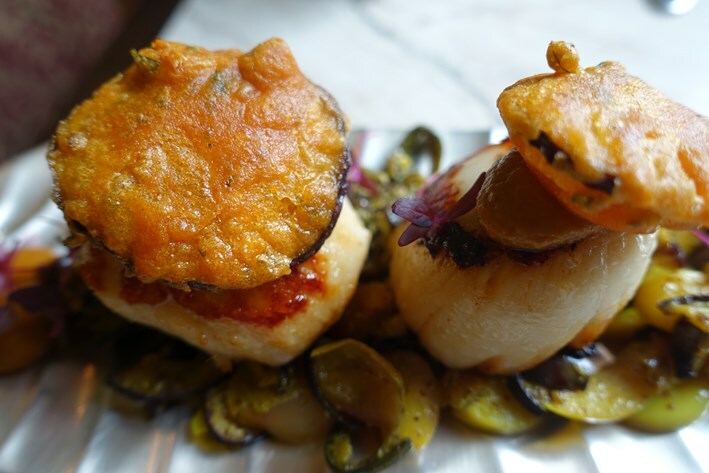 A pair of hand-dived scallops came with assorted texture of aubergine including a topping of aubergine fritters. The scallops were really excellent, plump and sweet and light cooked. The gentle spice and the aubergines were an interesting accompaniment (15/20). 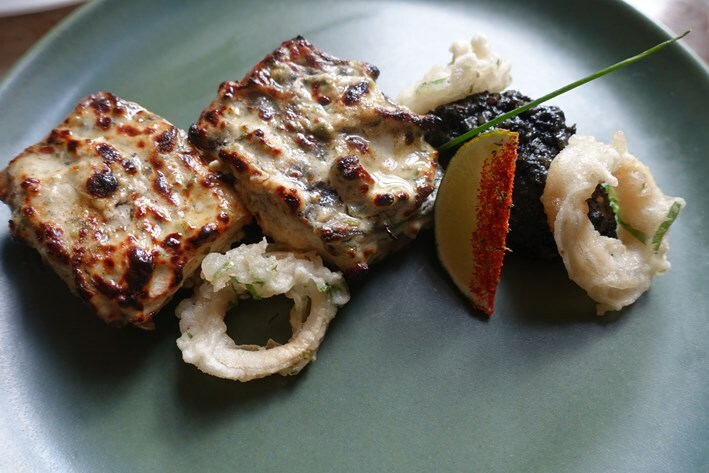 Stone bass tikka came with fried rings of squid and rice coloured with squid ink. 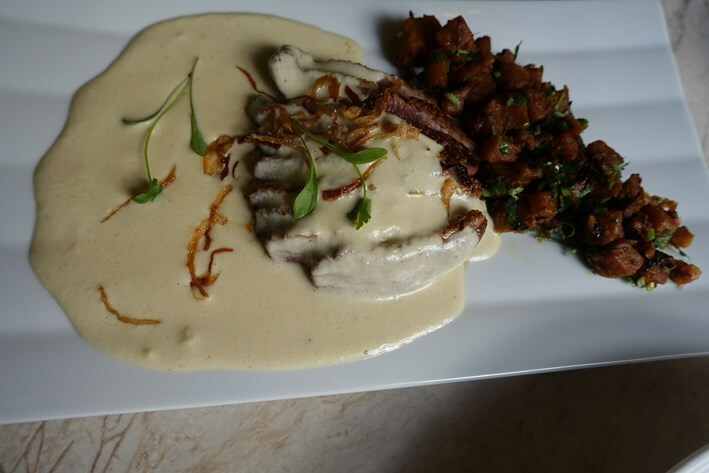 The fish was marinated before cooking with hung yoghurt, soft cheese, coriander stem, green cardamom and mace in “malai” style, resulting in a quite soft texture. I am not quite sure what the squid really added here, and I preferred the stone tikka itself when the same chef was cooking it at Jamavar, the texture having become a little softer than the other version. It was still good, but this was a dish where I think the kitchen was trying too hard to add extra complexity when none was needed, given how good the original stone bass dish was (14/20). 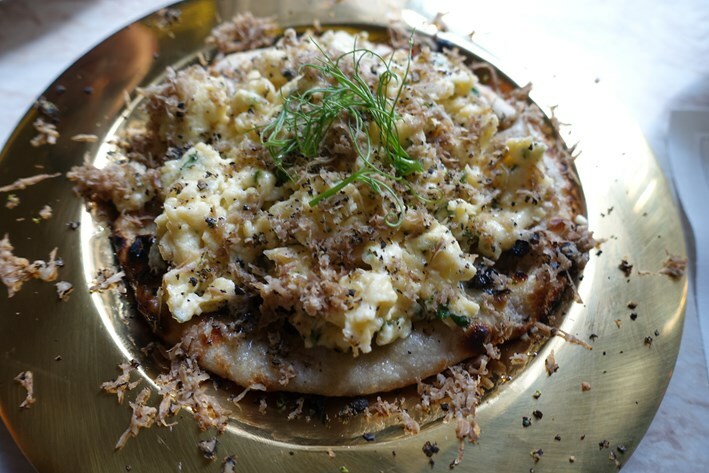 Quail naan was actually naan bread stuffed with quail meat and topped with scrambled quail egg with black truffle shavings. The bread was certainly good and the quail filling worked well, though overall this seemed a dish that had quite a lot of elements. Maybe it would work better just as a side dish (14/20)? I couldn’t resist having the lamb chop again, and this was just as superb as at my earlier dinner (17/20). 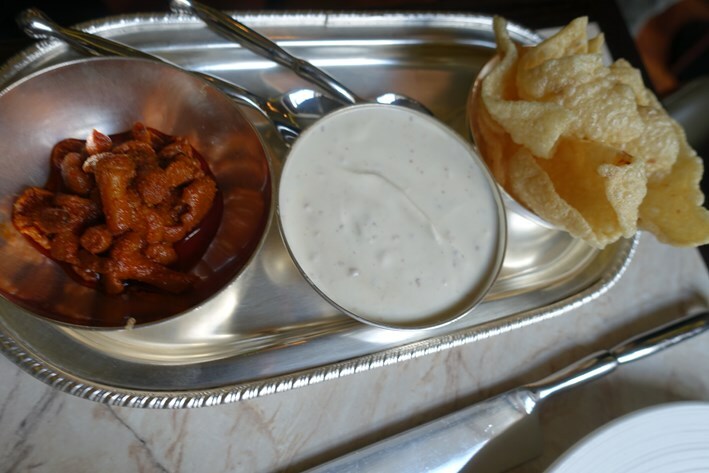 Duck korma was a fairly simple but nicely made dish, the duck slices cooked pink, the mild sauce having a pleasant hint of spice (14/20). 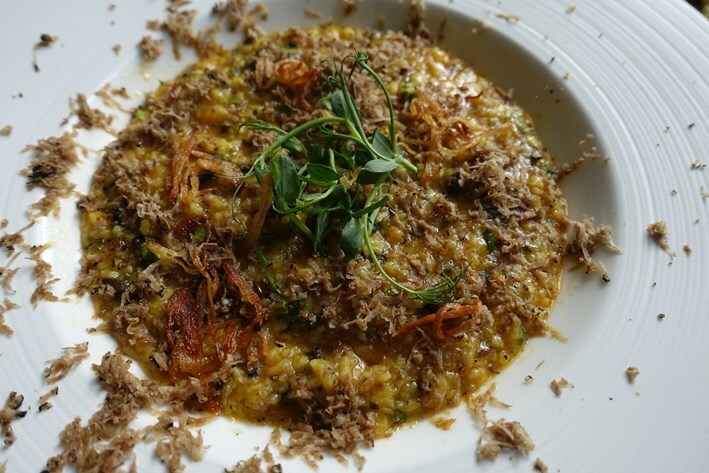 Mushroom khichadi was a rice and lentil kedgeree with wild mushrooms with black truffle (from Lombardy). This was an enjoyable and quite rich dish, the mushrooms going well with the pulses, the truffle adding an element of luxury (14/20). As before, a selection of breads was very good, this time featuring paratha, kulcha stuffed with cauliflower and naan bread (15/20). Service was again very capable, this time involving an Italian waiter that used to work at Jamavar. The bill came to £58 a head, with lots of food but just water and lassi to drink. If you ordered a sensible amount of food and shared a modest bottle of wine then a typical cost per head might come to £70 or so. 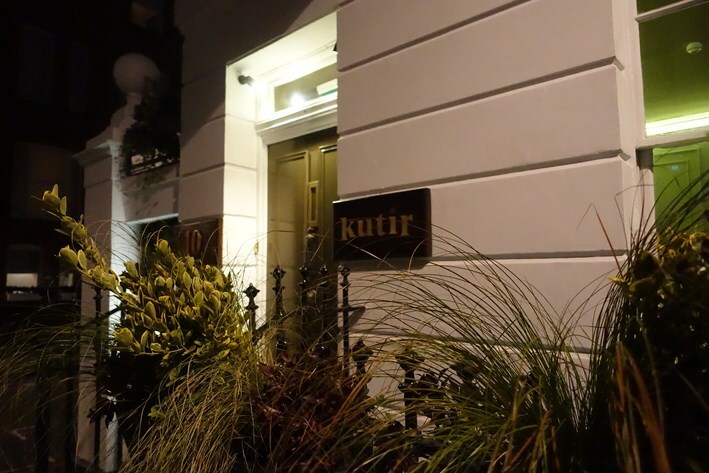 Kutir is cooking some very impressive food, even though it has only just opened. 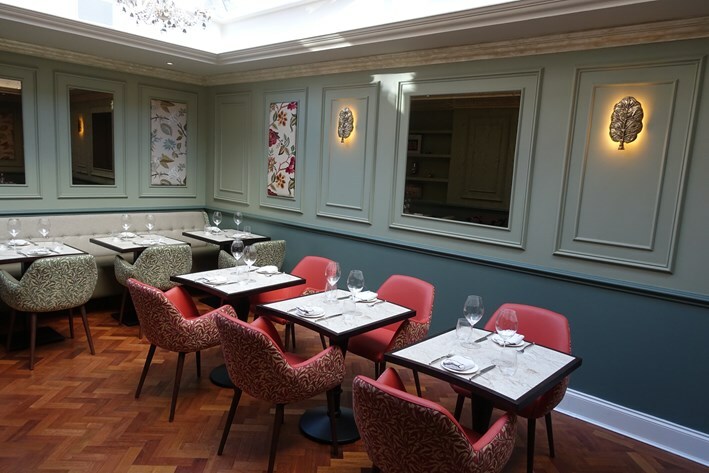 Kutir is clearly one of the best Indian restaurants in London, straight out of the gate.